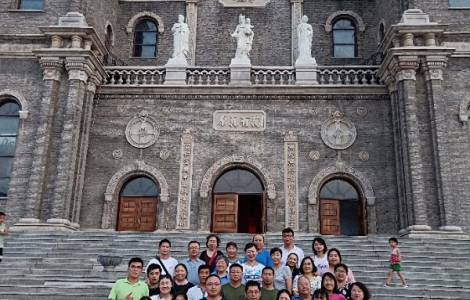 Beijing (Agenzia Fides) - The pilgrims reached the shrine of the martyrs of Zhu Jia He, in the Chinese province of He Bei, to ask with the prayer to the Holy Apostles Peter and Paul - whose feast falls on June 29th - the gift of the Church's unity in China. There are hundreds of Catholics from the parish dedicated to Saint Michael, in Hou Ba Jia, in the territory of the Archdiocese of Beijing. Their pilgrimage began at dawn on Saturday 23 June, and ended on Sunday 24 June, feast of St. John the Baptist. They all took part in this gesture of spiritual devotion with the same intention: to ask for the intercession of St. Peter and St. Paul, so that communion among all the baptized is increased in the Catholic Church in China. The parish of Hou Ba Jia, built in 2003 in a suburban area of Beijing, has a young and lively parish community. Pastoral and charitable activities - catechism, training courses for boys, girls, young couples and the most mature faithful, novenas, the rosary, the Marian month, summer camps for children, and even pilgrimages - see the involvement of young seminarians of the adjoining diocesan seminary. The invitation to participate in the pilgrimage and how to register were also disseminated through Wechat, the social media most used by young Chinese people. The shrine of the martyrs of Zhu Jia He, the destination of the pilgrimage, is located in the city of Jing Xian (today Heng Shui), in the Province of He Bei. It is a place dear to the memory and devotion of Chinese Catholics, for the martyrdom witness of faith and love to Christ, in particular by the French Jesuit missionaries San Leone Ignazio Mangin and San Paolo Denn, together with Chinese women like Santa Maria Wu. During the persecution of the boxer, in July 1900, the two missionaries had welcomed thousands of women and children who tried to escape from the violence of the persecutors. When the boxer attacked the church, Jesuit father Mangin, from the altar, and a crucifix in his hand, gave absolution from sins to all the faithful present, while they prayed on their knees. When the boxer broke into the church, Maria Wu was killed while she was trying to protect Father Mangin, who was administering the consecrated hosts to those present, Then, the boxer also killed Father Mangin, Father Denn and all the faithful present, before setting fire to the church.